I have been having a great time baking and cooking from Christina Lane's books and website, Dessert for Two. You might know that I favor small-batch baking; it meshes well for our family of 3 and lets me bake and cook (i.e., have fun) more often. It took me a while to discover Christina but it's certainly better late than never! I love her signature small-batch recipes and I've had a lot of delicious success with them. I know I can't (or shouldn't) post every one of the recipes I've tried but I had to post this one for a small-batch of 4 coffee cake muffins. They were just glorious! Plus, I always feel the need to give muffins some love and attention every once in a while because they are just so darn lovable. 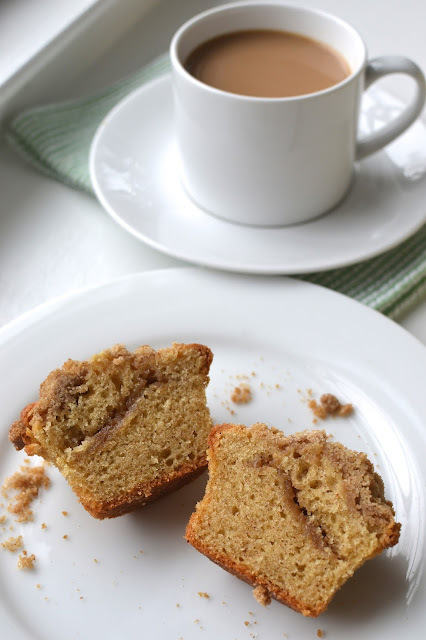 These coffee cake muffins have crumb topping not only on top of them but also a bit tucked in the center...because if you're going to eat coffee cake or crumb cake, you want plenty of those sweet crunchy crumbs! I whipped the batter up one morning by hand (many of Christina's recipes use a handheld mixer and since I don't have one, I've found they can easily be done by hand with a whisk or a wooden spoon given a little patience) and had these 4 muffins fresh for breakfast. I was impressed by how nicely risen they turned out, with a sturdy firm cake lightly infused with cinnamon and nutmeg, anchoring all the delicious sweet crumbly goodness. Some mornings call for a muffin, or two. Next time you feel like indulging in a sweet treat for breakfast, this is a great way to do that with a little restraint. After all, it's only 4 muffins...but I think they're 4 fabulous ones! In baking these muffins, I first started by making the crumb topping and leaving it in the refrigerator while I continued with the batter. After mixing up the batter, scoop 1 1/2 tablespoons (a #40 scoop is great for the job) of it into each of the four muffin cups. Then, add a spoonful of the crumb topping. This reminded me of the time I made jam-stuffed coffee cake muffins. Then, cover the topping with more batter and, finally, top each with the rest of the streusel. Had I done more advance planning, I might have finely chopped up some toasted walnuts (like this coffee cake) for the crumb topping. I am always thinking of ways to add nuts to things but I'm also mindful that my son isn't quite as big a fan of that. I was very happy with how golden brown, crusty, and puffed the muffins turned out. And it can all be done in a short period of time. It's a very sweet way to welcome the morning! Into the oven and you have puffed, golden-crumbed muffins in about 20 minutes to enjoy! While it's surely a treat to enjoy crumb-topped muffins fresh, we did (miraculously through self-restraint) manage to have one lone muffin leftover that my husband had the next day. He assured me that it was still moist and delicious the day after. I'm just throwing that out there in case anyone wants to double the recipe. There's nothing that says small-batch recipes can't be doubled or tripled! I was serious when I said that I've been fairly busy making a bunch of Christina's recipes...so can we indulge in a little more small-batch baking and cooking "show & tell"? The recipe for monster cookies from Baked is my favorite but sometimes you don't need dozens of them and just want to satisfy your craving with a few. So how wonderful is it to be able to whip up a handful of monster cookies, doing it simply by hand! It's so satisfying. In this batch, I used M&M's, Reese's pieces, as well as dark chocolate chips. Yum! And what other cookie do we crave all the time but the classic chocolate chip? Christina has a recipe for a small-batch of those as well. My husband was a big fan of these flat, soft, and slightly chewy chocolate chip cookies. And then...I tried potato-chip crusted pork chops. Yes, I said potato chips! The pork chops are baked but as you can imagine, the crushed potato chips that act as breading for the pork chops crisp up even more in the oven and I'll just say that, not surprisingly, the little guy was a big fan of this one! I've also made baked mac & cheese and cornflake-crusted chicken tenders. Needless to say, Christina's books (Dessert for Two and Comfort and Joy: Cooking for Two have been a great investment and I highly recommend them! Preheat oven to 375 degrees. Line a standard size muffin pan with 4 liners. Make crumb topping: In a small bowl, combine all the ingredients. Using your fingers, pinch ingredients together to make large clumps. Set aside in the refrigerator until ready to use. Make muffins: In a medium-size bowl, beat oil and granulated sugar together with an electric mixer on medium-speed for 4 minutes (if you don't have a handheld mixer, you can do this with a whisk by hand like I did). Add salt, egg, cream, and vanilla, and beat for about 15 seconds to combine. Sprinkle dry ingredients over top and beat until just incorporated (I used a rubber spatula). Scoop 1 1/2 tablespoons of batter into the bottom of each muffin liner. Top each with a spoonful of crumb topping. Then, divide the rest of the batter equally among the 4 muffin cups. Top each with the rest of the crumb topping. Bake for 19-23 minutes, until the muffins have puffed, the topping is golden brown, and a tester comes out clean. Let cool a few minutes in the pan on a cooling rack before removing muffins and setting them on the rack to cool to room temperature. They turned out so beautifully golden brown...that topping and filling..fantastic! Thank you, Medha. It's so nice to find some new things to easily make. My goodness you have been busy! I love the small batch baking and try to at least split a recipe if I can. The only problem with 4 muffins and 3 people is who will get the last one!? They are beautiful! haha - I think 4 muffins is intended for 2! I know that at my house, 1 regular/at-home size muffin usually isn't enough. We did manage a little restraint in this case but it wasn't easy. And these muffins sound perfect! I am definitely digging all these small batch baked goods! Hope you had a wonderful weekend Monica!! When I made cornflake-crusted chicken tenders, I tried a couple with potato chips...and the potato chip ones won out! : ) The small batch baking/cooking is a lot of fun. You have a great week, too, Ashley! yuuum! i totally love the muffins! i'd die to try one! Small batch!I am totally going to try this, haven't baked muffins from so long. I love to bake muffins. Though - we're not kidding anyone - this is cake! Such yummy cake and such fun to make. Hope you make some, my friend. WOW! These cake muffins look fantastic, Monica. I can almost taste them! SO pretty and delicious! Love they make a small batch! Monica I always find hard to cook for two, big batches don't always work for a small household like mine, so these are great tips! I am in love with these muffins. Looks super delicious. WIsh I could grab one right now! I thought they were pretty awesome, too, thanks! Wow! You definitely have been busy and it all looks amazing! I love the way you described these muffins, though of course the pictures say it all! I wish I could just whip up a small batch for tomorrow morning. I know for sure these will be in my dreams tonight. Thanks, Sonali. It's been fun trying some new recipes for dinner and baking is *always* a fun endeavor. Wow! 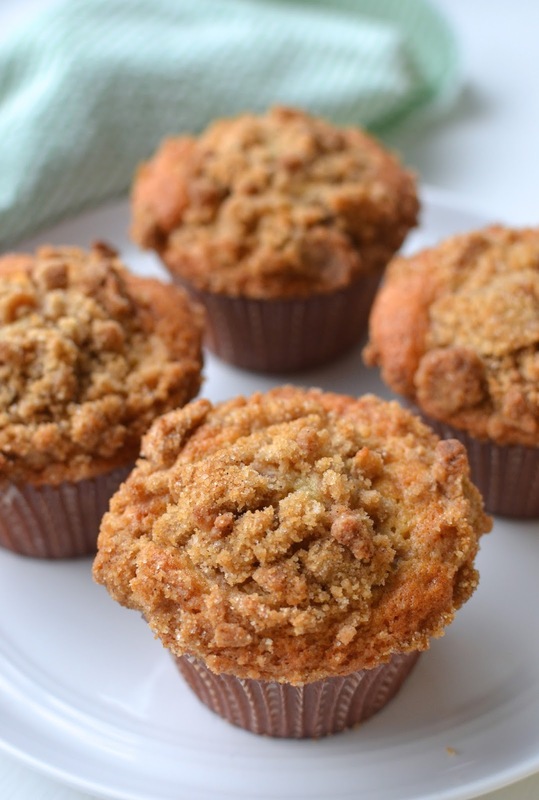 I love the look of the delicious crumb topping on these coffee cake muffins, aaand the surprise crumb in the middle! What yummyness (: I also appreciate that this is a small batch recipe. Thanks for sharing your experiences with the cookbook! I love leftovers but I do like to clear the decks so I can cook/bake more often. : ) Her books have been great! Hi Monica, I love the idea of small batches, it seems like I am always throwing food out and I really don't like to do that. Love the topping and the little extra something in the middle. Hooray for small batch! That way Bryan and I will never have to finish a dozen by ourselves! :) These muffins looks so moist, and I always love a crunchy crumbly top. Nommm... I would love some of these for breakfast! Oh yes, I recommend whipping up a batch of these muffins! Hope you're enjoying the weekend.